"Never underestimate young people. 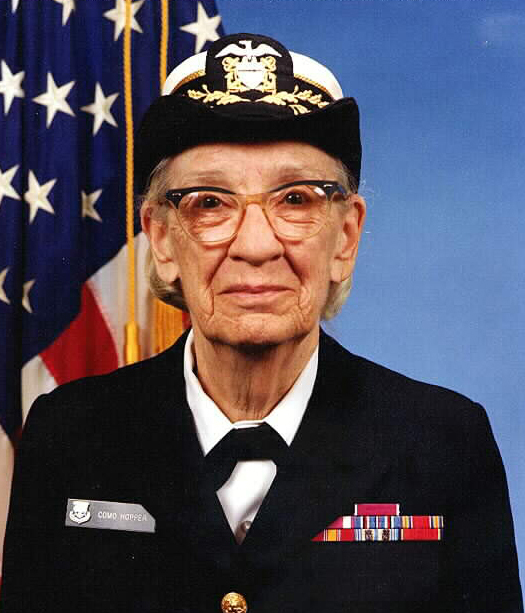 They have far more knowledge than we did at their age," said retired Rear Adm. Grace Hopper. She believes that what young people need most is leadership. Hopper was a pioneer. She received her Ph.D. in mathematics from Yale in 1934, one of only seven given out between 1934 and 1937. This was a rare and remarkable accomplishment for a woman at that time. Like all early computers, the Mark I could only do mathematical equations. The entire computer industry was shocked in 1952, when someone suggested computers could actually write programs as well. "I can make a computer do anything that I can completely define," Hopper said. She and her staff went on to complete the first compiler, the A-O System at Remington Rand. This was the start of programming language development. Eventually, there were as many different languages as there were computers. This posed a problem. Anytime a person changed computers, he had to learn a whole new language. The entire computer industry agreed upon the need for one standard language. Academia, computer manufacturers, computer users-all came together to develop the COBOL. One of the characteristics they desired was to make maximum use of simple English, thus making the language easier to use. Contrary to popular belief, Hopper is not the "mother of COBOL." She served as one of the advisers to the executive committee, whose purpose was to coordinate the efforts of the entire group. She undoubtedly had a significant influence on the development of COBOL. She remembers the computer industry almost let COBOL die. A year had passed and no progress had been made according to Hopper. It took a marble tombstone shipped express collect to the Pentagon from Howard Bromberg, an RCA representative to the COBOL meeting, to get the project completed. Hopper spent most of her career working for the Navy. She was forced to retire in 1966 only to be called back "for six months." She said it turned out to be the longest six months of her life. She finally retired for the last time in the summer of 1986. She firmly believes that serving in the U.S. Navy was the greatest privilege and responsibility that she could have in her lifetime. She also believed in the people she worked with. "I wish civilians and officers would recognize what our young people, what our enlisted can do," she said. "Too often we think that the lowest person working for a contractor is better than our own people. Our own people are head and shoulders above anything we can get through contractors," she concluded. The rear admiral also believed the Navy should allow its own people to lead the way and make the new developments. "We've always done it that way" is a concept she has fought against throughout her career. She promised if anyone ever used that phrase, she would instantaneously materialize beside them and haunt them for 24 hours. "It takes one year to develop an idea, and nine years to make anyone believe it works." Hopper also fought management all her life. "It takes one year to develop an idea, and nine years to make anyone believe it works," she said. Her greatest problem was selling her ideas to management. There was a line out there beyond which management couldn't accept a new idea. The solution was to educate management to keep pushing that line farther out. Perhaps the secret to her success has been the need to keep learning. "Anyone who gets into computers can never stop learning," she said. "Because the changes are coming faster, the developments are accelerating." Hopper believes in young people because they know more, question more and learn more. One look at this feisty old woman, however, and it's easy to see that you don't have to be young to be on the leading edge of technology. She's been there all her life.